On Tuesday, Rev. Fr. 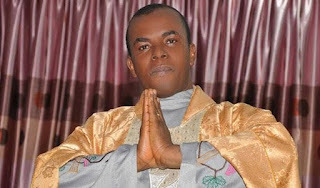 Ejike Mbaka, The Spiritual Director, Adoration Ministry, Enugu, Nigeria, AMEN, released his prophecies for the year 2019. Mbaka urged Nigerians to pray hard to overcome what he tagged ‘impending unimaginable difficulty’ in 2019. He advised Nigerians to support President Muhammad Buhari to continue his fight against corruption.